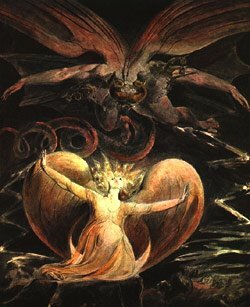 William Blake - "The Great Red Dragon and the Woman Clothed with the Sun"
Love defeats hate they say. Why? Hatred is rooted in disunion-consciousness and the selfish desire for exclusive dominion based on a self-prescribed worth which stands atop others. Love on the other hand is rooted in union-consciousness and the desire to share joy, resources, knowledge and so on. In this dichotomy love has the fundamental advantage because it is based on Truth. Hatred is the outcome of an equation that never correctly adds up. The math will never be correct to justify it. Division is an illusion. angry child insisting upon its way. The source which hate draws from is limited and thus its energies are uncontrolled. It is fearful. It is desperate. It has to work overtime to make its falsehood equate but it never will, thus its inevitable defeat. Given a choice people will ultimately choose love over hatred... Truth over falsehood. Love absorbs even hatred... much to the horror of hatred's horde. Union heals and so hatred benefits from love. This is the secret of these love-wounded souls... they have a splinter. They have been infected by the poison of disunion through mistreatment, injustice, racism, abuse, etc. Hate, unlike love, can never "heal" anyone. Time and again it is acknowledged, embraced and healed by love. Like pure water running over the hardest stone love will ultimately wear hatred away. Love is verdant and eternal. The oppositional force which fuels hatred is not a sustainable energy. We are actually only oppositional - a duality - on the surface. This is what we learn from the mystic union of male and female... they are two halves of one whole. Differing in function but with shared purpose. Hate and all the evils associated with it persist in neglecting this wide sweeping fact. Ignoring the Truth however does not negate it. Love will not be ignored or silenced because it is life's natural well of ecstasy. Love bespeaks a mad, self-transcending devotion. It is a spiritual experience. Union is a liberation. Oneness is a liberation... beyond the finite self. Hatred bespeaks an isolationism whose madness binds and contracts rather than liberates. Hatred can grow grotesquely to become a religious experience, replete with ritual and lore - a patriotic experience... a cultural experience... limited within narrow confines, both fed and doomed by its isolation. The Truth of love and union is glorified in its pervasiveness. Its ubiquitous universality only amplifies its extant nature. From East to West, ancient artifacts to new cultural expressions; from the core of our dogmas to the heart of our traditions... love and union appear resurgent. That it appears in various guise and culture does not negate any singular expression; rather, Truth stands affirmed. Union stands affirmed in its diversity. For love to defeat hate we simply choose love. We maintain an openness to look out beyond our personal experiences to see the "other." We forgive. We help. We give our love unconditionally. The female-in-discipleship is very important here, as she is love's proof. She proves that two are one... that opposition is an illusion; that love is supreme. Her willful submission is not a sign of her inferiority, rather it is both a gauge of male leadership's capacity to love and the investiture of his natural authority. Divinely attuned natural authority, expressed through lovefull self-mastery, heals the world. for embodying the truth of which I speak. Without you I would have no words.